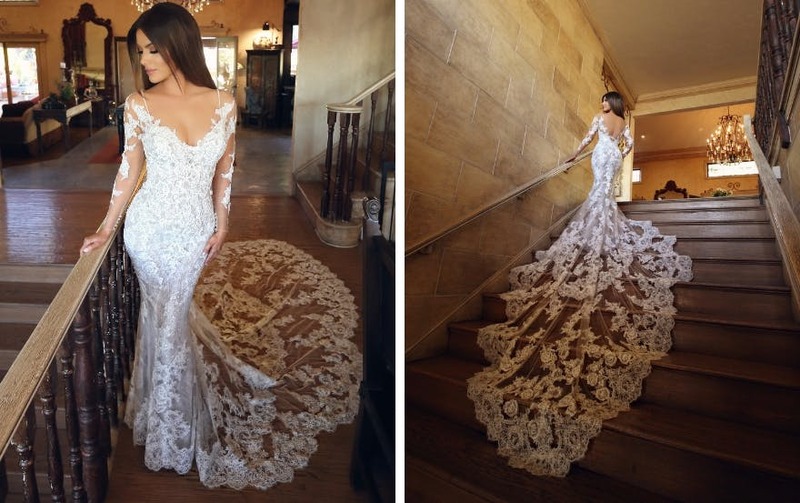 Enzoani’s latest styled shoot saw the team travelling to the picturesque hills of San Fernando Valley to capture some of Enzoani’s 2019 collection. With talent from Jay Jay Studios paired with the gorgeous Linda Chiriac, they’ve captured four of Enzoani’s stunning gowns in all their beauty. The NIKITA gown first appeared on Enzoani’s social pages after its debut in Los Cabos, Mexico and is set to be a favourite for brides because of its sultry yet sophisticated look. The full-length mermaid gown is a real showstopper with a regal lace pattern, sultry bodice and elegant train. While its silhouette and unique lace pattern are certainly part of NIKITA’s appeal, its sweetheart neckline and corset-like bodice also help to shape a bride’s figure, making this gown fit like a glove on any bride on her wedding day. Find out more about this gown here. Effortlessly elegant, NEVILLE is a one-of-a-kind gown from Enzoani’s signature collection. Chic and sleek, it has gorgeous beaded lace throughout its gown that is said to be similar to peacock feathers or seashells. And, just like NIKITA, NEVILLE has a unique lace pattern that isn’t the traditional floral or Chantilly lace. NEVILLE is light-weight with a modest train and scalloped hem, making it the perfect gown for any beach or destination wedding. Find out more about Enzoani here. The NIKOLA gown is perfect for the bride who wants the right touch of feminine feel without going over the top. This pretty dress is a full-length, A-line gown made of sleek organza covered in sweet floral embroidered lace. The lace on this dress starts at the collarbone and slowly fades to the skirt around the bodice. This helps to shape the bride’s body making it a perfect A-line gown. NICOLETTE B is for the modern bride looking to make a sweet, playful statement. This gorgeous gown is sure to check off many brides’ lists with its mermaid silhouette, floral long sleeves, and a deep open back. Brides will love this gown not only for its signature Enzoani two-tiered train but also because of its two-in-one gown (outer long sleeve layer over a sleek spaghetti strap mermaid dress)! Ready to meet your dream Enzoani gown? Or want to try on a few of your favourite? Head over to Enzoani’s store locator page where you can find all of the retailers who carry the brand.